It is always exciting to return to wines that one appreciated a few years earlier. But the questions are many: is it as good as I thought, did I misjudge the quality, has the wine survived cellaring? In Alsace, one can expect that wines from quality producers have become even better than you remember them. And Emile Herzog is undoubtedly a quality producer, although the microscopic firm run by an elderly lady who makes her wines in the basement. Fascinating, and very different from mega domains that produces world wines with no character. 2007 Riesling Langgass from Emile Herzog in Turkheim offers aromas of inripe pears, lemon, lilac and warm soil. The palate is silky but dry, medium bodied and nicely balanced with lovely acidity and a slightly spicy finish. Exciting wine from a very flat vineyard between Turkheim and Winzenheim, consisting of loess on an aluvial deposit. Price (2013): € 7.80. Munster Valley is not only the home of the famous Munster cheese. Here the Schoenheitz family, basically the only winemaker in the valley, makes superb wines from their vineyards Holder, Linsenberg and - not least - Herrenreben. The vineyard strains from the Middle Ages and belonged to the clan Ribeaupierre who then ruled much of Alsace. During World War II the village Wihr-au-val was burned to the ground by the Wehrmacht as an action of retaliation. Since then the Schoenheitz family has spent decades to recreate the vineyards with their bare hands. 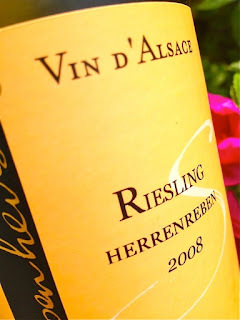 2008 Riesling Herrenreben from Schoenheitz in Wihr-au-val has a complex, classical fragrance with citrus, petrol, honey, white flowers and a slight note of herbs. The flavor is medium-bodied, lively, crisp and focused with ripe fruit, high and vibrant acids and a marked saltiness in the finish. A wine that shows that Henri Schoenheitz is a masterful winemaker. Price: € 9.70. The villages of Saint-Hippolyte and Rodern are well known for Pinot Noir. The vines grow on granite slopes above the villages where the land is unusually clayey to rest on granite. The warm earth and the exposure maks the grapes ripen perfectly. Not least in Rodern, several small producers make serious Pinot Noir ranging from rosé to powerful, oak aged reds. And every year in the month of July a Fêtes du Pinot Noir is held, a giant festival is held where wine flows, tartes flamées are eaten by the thousands and a Reine du Pinot Noir is elected. 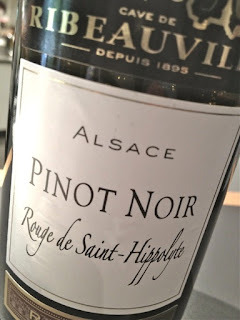 2011 Rouge de Saint-Hippolyte from Cave de Ribeauvillé has a well pigmented cherry red color. The fragrance is young and fruity with ripe cherries, plums, cranberries and a touch of dill. The flavor is barely medium-bodied with fine acidity, good volume of ripe fruit and just the right amount of tannins. A good wine from a big producer that rarely delivers anything interesting. Price: € 9.50. 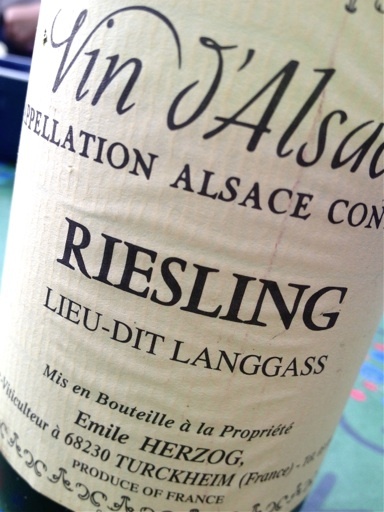 Among wine growers in Alsace, the opinion prevails that Swedish customers ask for dry wines. The focus immediately on the dry, high level Rieslings and couldn't care less about Pinot Gris and even less about Gewurztraminer. But when they leave the cellar, they have been seduced by lush opulence of off-dry wines. 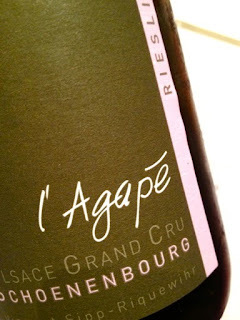 At Agapé, run by the dynamic and utterly skilled Vincent Sipp, the entire spectrum of wines tastes great. This style of this masterful winemaker rests on the dry side, and he manages to get the best out of his three Grands Crus: Osterberg, Rosacker and the fabulous Schoenenbourg.